Sustainable green city - cescoitalias JimdoPage! 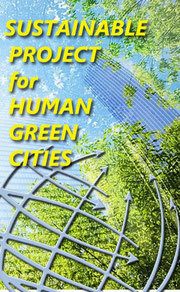 It is an operational method for the management of sustainable urban development. We proved that urban management can improve through the joint analysis of the environmental,social and economic sciences, of urban and building design and of the technics of construction, thentransferring research results into design decisions and operational strategy. This way, we tackle thecomplex subject of living, of the land use, of energy saving and of a better use of natural resources inan integrated way. This Italian experience is twenty years old (see the “Contratti di quartiere”, literally: “neighbourhoodcontracts“) and is feasible in accordance with Albanian culture operators having similar degree ofexperience. The group I represent consists of university professors, architects, urbanists, specialistsin environmental problems and green technologies, specialists in economics and social analysis. - Mr. Raffaele Bracalenti, physician and psychoanalyst, president of IPRS - Istituto Psicoanalitico per le Ricerche Sociali (Psychoanalytic Institute for the Social Researches), a Rome based research institute oriented to the analysis of aggregation mechanisms in civil society. The group is also integrated with Italian entrepreneurs of the field, involved in the study, productionand utilization of advanced technologies.